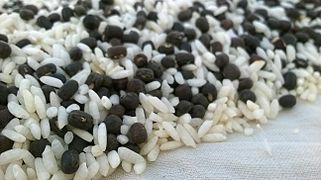 The recipe mentioned in these ancient Indian works leaves out three key aspects of the modern idli recipe: the use of rice (not just urad dal), the long fermentation of the mix, and the steaming for fluffiness. The references to the modern recipe appear in the Indian works only after 1250 CE. Food historian K. T. Achaya speculates that the modern idli recipe might have originated in present-day Indonesia, which has a long tradition of fermented food. According to him, the cooks employed by the Hindu kings of the Indianised kingdoms might have invented the steamed idli there, and brought the recipe back to India during 800-1200 CE. Achaya mentioned an Indonesian dish called "kedli", which according to him, was like an idli. However, Janaki Lenin was unable to find any recipe for an Indonesian dish by this name. 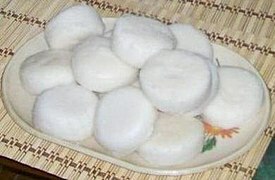 Some authors claim that Sanna, fermented rice cakes from west coast of India were often called Hitt or Hittli in old Konkani by Hindus, and are now commonly known as Idli. ^ सुनापरांत चवथ 2006 विशेशांक (Sunaparant). Goa: Sunaparant. 2006. p. 35.